Power Manager 4.1.3 is now available. Power Manager is an energy saving solution for Mac OS X. Use Power Manager to reduce the running costs of your Macs, to save time, and to save energy. This update adds support for Mac OS X 10.8, aka Mountain Lion, and Gatekeeper. The update promotes where Power Manager's lives on your Mac. 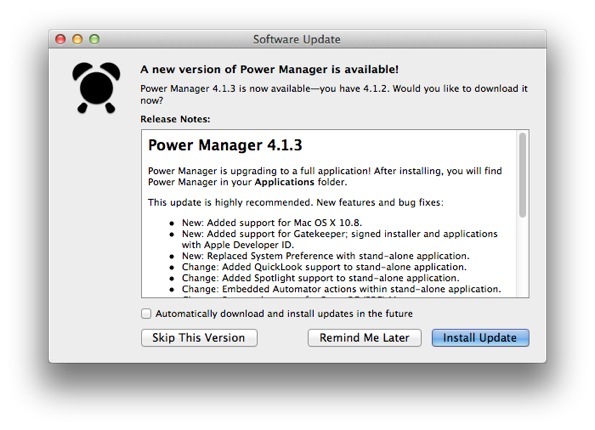 Previously Power Manager lived in the System Preferences; with v4.1.3 we have upgraded Power Manager to a full application. On the surface the user interface remains largely unchanged. The new application continues to work as the System Preference edition did before. Underneath the surface, this move has allowed us to better package Power Manager and is opening up new ways for Power Manager to work with your Mac. We recommend this update to everyone using an Intel Mac, running Mac OS X 10.6 or later, to update today. You can update using the built-in software update mechanism: System Preferences > Power Manager > Version Number (bottom-right) > Check for Updates…. New: Added support for Mac OS X 10.8. Change: Removed support for Mac OS X 10.4 and 10.5. Refined: Reduced size of and simplified self-signed certificate. Refined: Sped up AppleScript support and reduced memory use. Refined: Improved packaging; less packages and smaller file size. Refined: Added expiry date and revoke to licensing interface. API: listen.applysocket default changed to TLSv1; previously negotiated. Apple has not yet released Mac OS X 10.8, aka Mountain Lion. This means Mac OS X 10.8 could change from the Developer Previews we have been testing with. If changes occur and Power Manager needs updating, we are ready and will publish an update as soon as possible. This article was posted in PM4, and Power Manager and tagged release, and software update.